This passive (no batteries or line power needed, just the audio signal itself) audio level meter can have it's input impedance set to 40 different values from 2.5 to 20,00 Ohms. The frequency range is 30 to 10,000 Hz. This appears to be very conservative, s/n 177 was measured relative to an Agilent (HP) 34401 DMM and the upper range appears to be around 100,000 kHz and the lower end below 5 kHz if you use -3 dB. The official frequency range must be to a very tight amplitude specification. 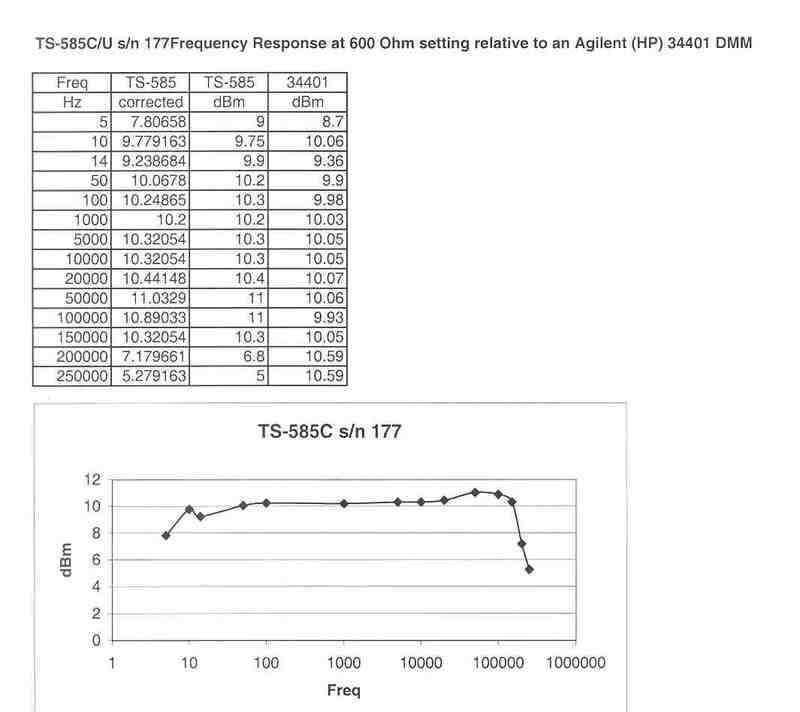 See data for TS-585C s/n 177 on eBay. The attenuator can be set to 4 ranges covering: -10 to +7, 0 to +17, +10 to +27 and +20 to +37 dBm referenced to 1 milliwatt. The top 13 input impedance ranges have a DC resistance that's the same as the AC impedance to about 3 digits of accuracy. The rest of the Z ranges have a DC impedance much lower than their AC impedance because a multi-taped transformer is used for impedance transformation. B, C and D are in the aproximate 8 1/2x11 size case. 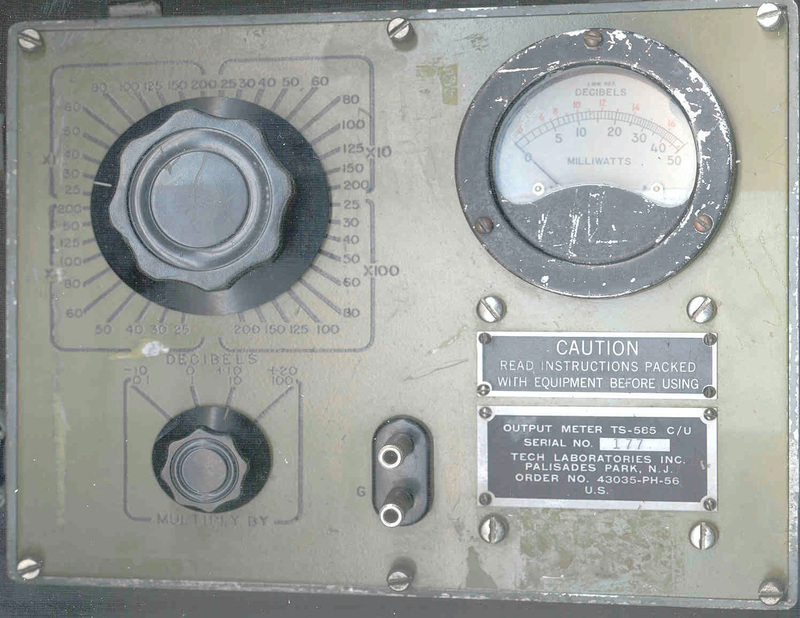 This instrument could be replaced by a true RMS reading AC voltmeter with a shunt resistor in the input to set the meter impedance. But for determining the output impedance of a source the TS-585 is much easier to use that fooling with many fixed resistors. Just rotate the Zin step switch and look for the maximum reading. Plot of TS-585C meter reading vs. Zin from HP 204C 636 Ohm Rs osc. It also could be used to determine the impedance of an audio load such as headphones by using the input impedance in series with the load and looking for 1/2 the voltage across the TS-585 and 1/2 across the load. TS-585D/U meter Zin analysis spread sheet, calculates Zin based on voltage across TS-585 and open cirucit voltage. The source resistance (Rs) of the 204C Oscillator comes out to either 636.2 (based on a decade box meas) or 632.5 to make the average error % of the TS-585 equal to zero, about 0.5% difference in the Rs values. The Fluke AN/USM-486/U may replace the TS-585. The manuals for it are: TB 9-6625-2274-35, TM 11-6625-3055-14, TM 11-6625-3055-24P. " In applications that require a variable input impedance, the AN/USM-486 does not replace the TS-585." 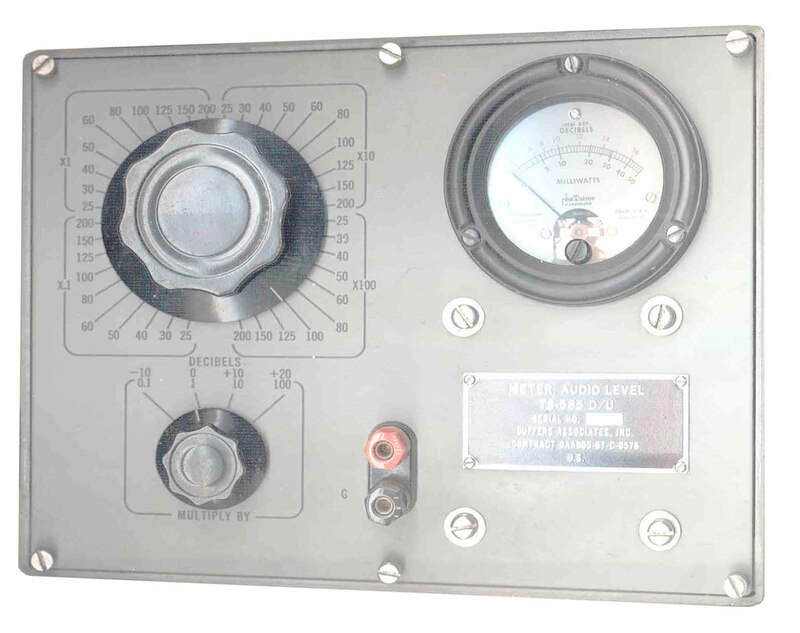 Set 8648A Signal Generator for RF frequency of radio (51.0 MHz), FM modulation with 12.5 kHz deviation and 1 kHz modulation, 3 uV RF level. Connect to radio using 68AA Antenna Adapter. Connect Military Radio Headset/Mic Test Harness pins A (gnd) and B (spkr out) to the TS-585. Turn on radio with VOL at maximum. Rotate the impedance knob to maximize the meter reading and use the MULTIPLY BY range switch to keep the meter on scale. Record the impedance and audio output power. This test was using whatever battery was on the radio. A more accurate way would be to power the radio with an external. 15.5 VDC source. The Agilent (HP) 8648A MOD Output has a 50 Ohm source impedance and + 5 dBm (3.1 mW) of power. Connect one of the outputs from the HP 204A Audio Generator to the "A" terminal on the Military Radio Headset/Mic Test Harness and connect the other to the TS-585 input connector. Connect the remaining TS-585 terminal to the "B" terminal on the Military Radio Headset/Mic Test Harness. Use the impedance knob to maximize the meter reading using the MULTIUPLY BY range switch to keep the meter on scale. H-250 Handset = 1,500 Ohms AC impedance at 1 kHz. 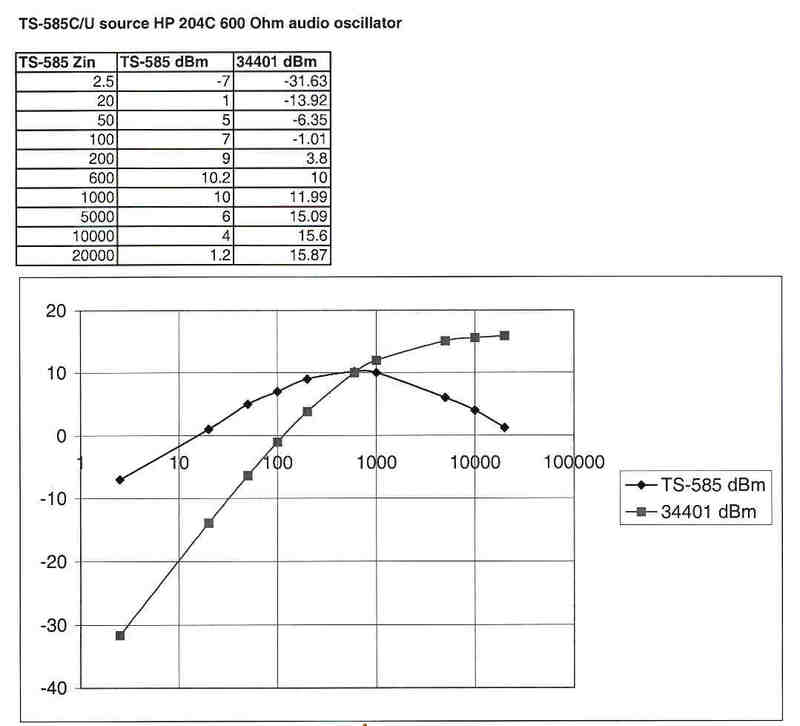 The HP 204B Audio Oscillator can be used with the TS-585C/U to test the frequency response of audio devices. This is the time this page has been accessed since since 3 July 2001.